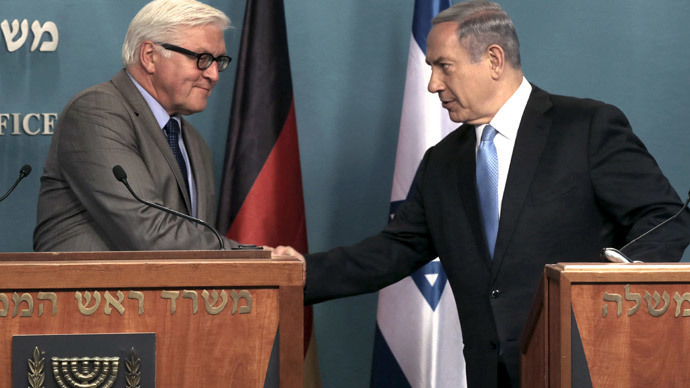 “I remain committed to the idea that the only way we can achieve a lasting peace is through the concept of two states for two peoples – a demilitarized Palestinian state that recognizes the Jewish nation state of Israel,”Netanyahu said after talks with visiting German Foreign Minister Frank-Walter Steinmeier. The latest statement seems to be a sharp policy u-turn from his loud, day-before election claim, in which Netanyahu said as long as he remained Israel’s PM he would never allow the creation of a Palestinian state. That and similar pre-election statements were ill received in Washington and across Europe. Netanyahu also faces increasing pressure from the Europeans who actively support the Palestinian push for statehood. For instance, the European Parliament last year adopted a resolution recognizing Palestinian statehood in principle, while the Vatican became the latest country to recognize the state of Palestine last month. Talking to his cabinet ministers the same day, Netanyahu said that Israel faces an “international campaign to blacken its name.” The aim, according to the Prime Minister is to undermine its existence. The PM’s comments came on the heel of a Palestinian motion to suspend Israel from FIFA, that was eventually dropped but stirred a lot of controversy worldwide. “We are in the midst of a great struggle being waged against the state of Israel ... it is connected to our very existence,” Netanyahu said. It is an attack on what “we symbolize and what we are,” the PM said. “I think that it is important to understand that these things do not stem from the fact that if only we were nicer or a little more generous — we are very generous, we have made many offers, we have made many concessions — that anything would change because this campaign to delegitimize Israel entails something much deeper that is being directed at us and seeks to deny our very right to live here,” he said. Whether or not Netanyahu’s sudden change of heart towards a Palestinian state will hold, remains to be seen. For over 50 years, the Palestinian Autonomy has been seeking full statehood and independence from Israel, while the Israeli government has sought ways to legitimize settlements, growing in number, widely regarded as violation of international law.